What is Liquid Soul Industries? The answer to that may depend on who you ask. In a way, they’re all right. 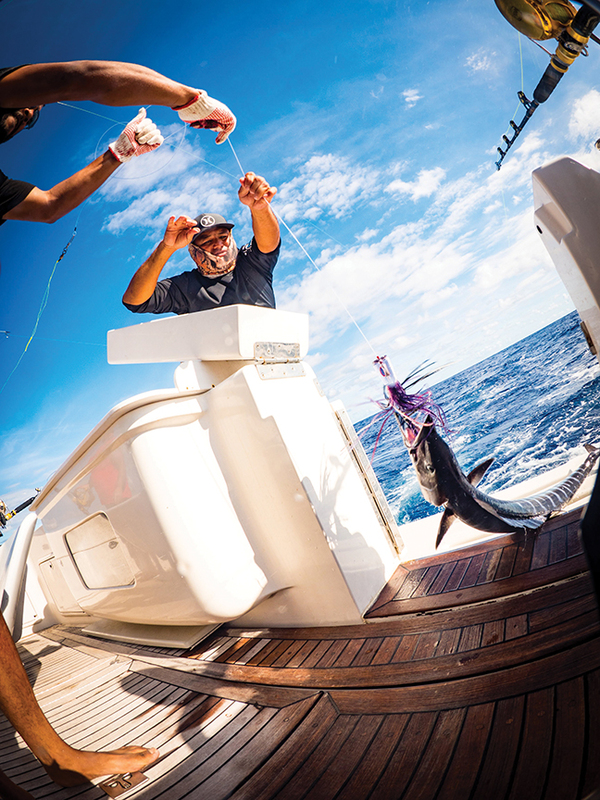 At the end of the day, he says, it’s a lifestyle brand, one that offers fishing and diving charters, sells clothing and other gear and produces various forms of media, like underwater video and photography. On any given day, he and his crew may be taking tourists out into Agat Bay for an excursion. Another, he and his uncle could be printing Liquid Soul t-shirts, which he sells online and at Mosa’s Joint. Or, he may be busy capturing and then editing footage of sea life for a client. The company, which started in 2011 and now has about five employees, seems fluid and constantly evolving. And that’s how Weir likes it. 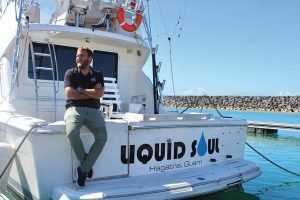 Sitting on the company’s 58-foot Riviera sportfish yacht docked at the Agat Marina one recent sunny morning, Weir shared how his company began, proudest moments over the years and advice for anyone who wants to pursue a business venture as multifaceted as his. My mom was the one who got me started in it. I just made these fun fishing videos and put it on Facebook. And [only] six people would watch it, and another five people would watch it. She was like, “Sit down … and focus on making a nice video. Take your time. I don’t want to see it for three days.” So I edited it. It was my first video that I tried to do transitions and stuff, and put it up on YouTube. I was driving a boat one day, and my phone just starts going “bing, bing, bing.” I looked down and saw that so and so subscribed to you on Youtube. So and so sent you an email. So and so messaged you. I was like, “What’s going on?” Then I clicked on GoPro’s page and there was my video [of manta rays]. I started jumping up and down and running around. That was kind of the initial take off. Over the years, you said you’ve done production work for Guam Visitors Bureau, Big Fish Creative and most recently for BBC’s Blue Planet II. How was that experience? I was assisting [the BBC] on the shoot here. So, it was really great to work under such a high name producer and such an awesome camera man. You’ll see the segment kick off with an aerial shot at Facpi Point (episode six, “Coasts”). We started our [part] working out of Toguan Bay and Tagachang Bay. And it’s on blennies, a mudskipper. It was on their mating habits. It was really funny because we sat on the shore just filming these tiny fish — sat there for hours, just waiting and waiting and waiting. When nothing was happening, we would take a nap under a tree. And when the tide changed, we would start to see them get more active and [begin shooting]. It was like that for three weeks. I got a couple a credits, so I am happy with that. It’s the most valuable thing to be able to put on a resume or CV. 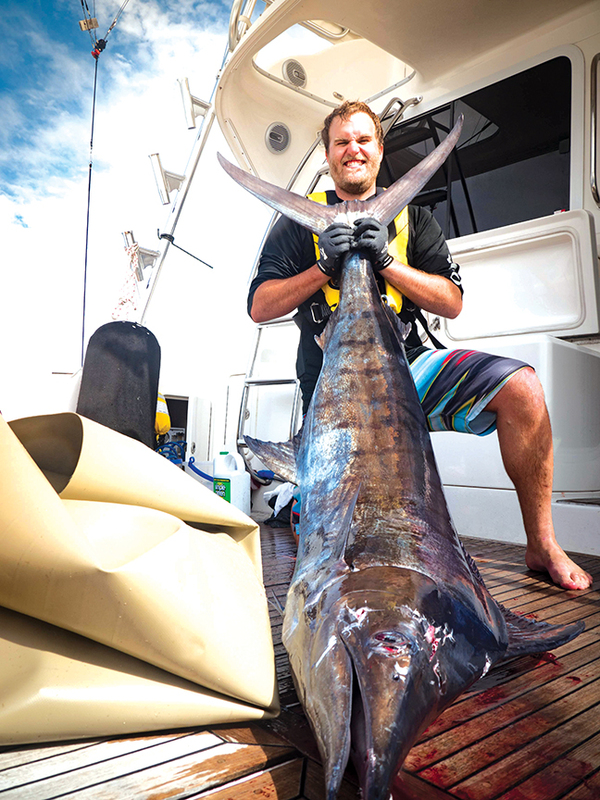 Four years ago, you started offering fishing and scuba charters for tourists. What can customers expect? It’s a big boat, but we take just six people. We really like to sell the experience, as far as being in the water with them if they are diving, and just kind of one on one. The boat itself has a few bedrooms if they want to relax during the day. It’s like a VIP experience. What makes that part of the company stand out from competitors? [The experience] is one of the things we want to do with this boat that will make it different for us compared to all these other ones. I think what correlates with Liquid Soul and the lifestyle itself is being able to have overnight trips and have a chef on board. If it’s somebody who wants to go out to have a really nice VIP dinner and is willing to spend a little extra for that night or whatever they want to do for that tour, we can do it. The others are limited. They are fishing boats — but it’s not this fishing boat. We’re not going for the volume, we’re going for the quality. It’s totally different than just going out and looking at dolphins. What retail does Liquid Soul sell? Hats, shirts, sunglasses, rash guards, face masks, sun shields. We sell fishing tackles at Into the Deep, too. What are some accomplishments you are most proud of? That’s a hard question. There are so many different things. 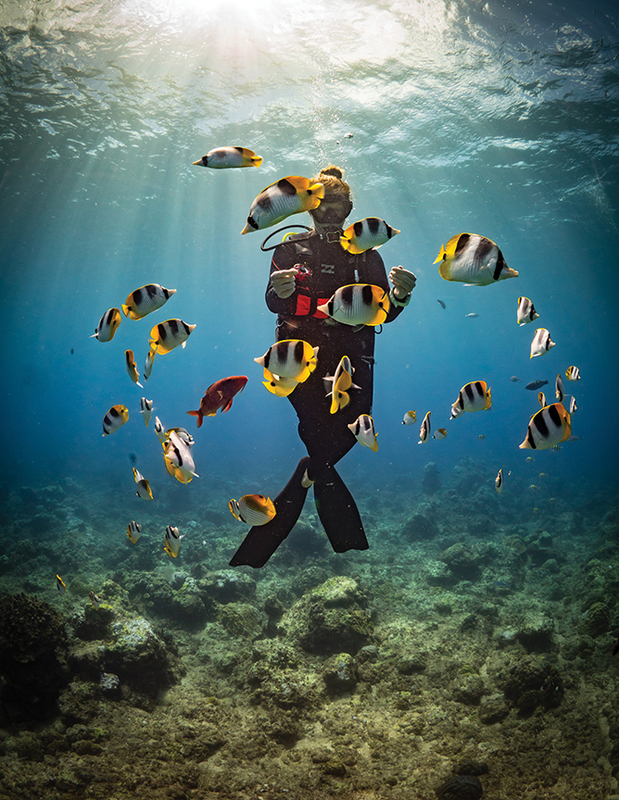 I got a seven-page spread in a diving magazine. Being featured in Hawaiian Skin Diver was also really cool because that’s what first got me started. I was looking at that magazine before I even put a camera in my hand. Working on Blue Planet II was really neat. I’m extremely proud of the boat, too, and to be partnering with someone who believes in the image and lifestyle. How has the business grown? It’s been more people, but it’s really just the opportunities that have opened up. We’ve gotten more video contracts. And then when there is not a lot of video, the shirts are selling well. And then when the shirts aren’t selling well, we got a lot of charters. And then when we are not charting, video works comes in. What’s next for Liquid Soul? We want to expand our clothing … and take more advantage of online. I believe in doing it differently. We want to get our stuff out to Hawaii. We have some good opportunities [coming up]. I’m also in the process of selling a portion of the business and bringing on a new partner. What’s your advice for someone who is thinking of starting up their own lifestyle brand? Focus on media and being genuine. Those are the two biggest things I find helping me and my brand. [Customers] like the brand because they feel like they are a part of it. You don’t necessarily need to define it specifically. Let the brand define itself.